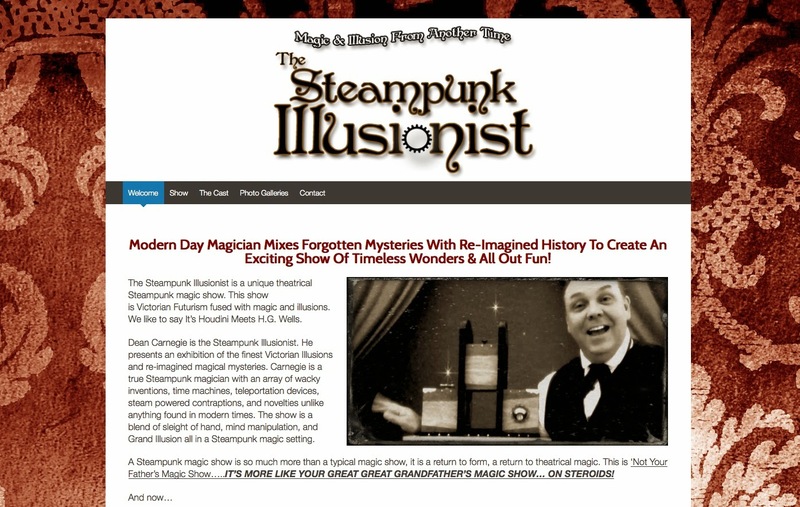 I spent the weekend making tweaks and updates to my SteampunkIllusionist.com site. I was not happy with the conversion rate on the site (meaning the number of people who signed up for my newsletter or e-promo kits). The way the site is set up, I think, is kind of cool. I've taken the Wizard of OZ approach, in that everything that you can see on the outside is made in sepia toned colors. But once you sign up for the newsletter or e-promo kits, you get to see everything in full color. The e-promo kits are essentially the same as the promotional kits and dvds that I might send a client in the mail, except now you can view them online. There are videos, some of which can only be seen within the e-promo kits and no where else. I also have full descriptions of the shows and prices for most of the shows. One of the videos is of The Disectolator in action. That's the illusion featured in the photo above, as well as the subject of a number of my previous blogs. Speaking of The Disectolator, I'm getting ready to work on The Disectolator 2.0, which is going to be slightly different from the original, in both appearance and execution. I got an email from someone the other day asking me about the picture to the right. They had seen it on my site and wondered what exactly it might be. 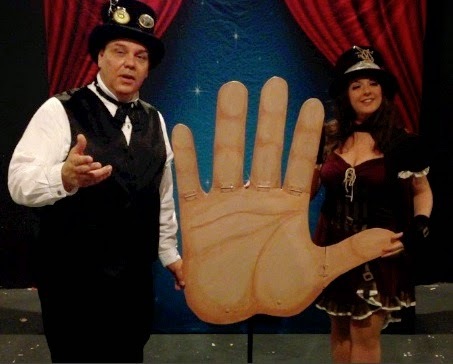 Believe it or not, it's an interactive routine that involves the entire audience. There are currently three different routines that can be done with this prop, and more possibly on the way. The routine was not originally supposed to be in the steampunk show, but it's such an oddball kind of thing and given the fact that the hand is actually mechanical, I thought it fit in quite well. I'm contemplating making another hand to replace this one that is more robotic. Right now, with the current hand the fingers bend down and that is all. But I'd like the make the hand so the fingers bend at every joint and could be operated from backstage. It might be too much effort for one routine, but we'll see. By the way, if you'd like to see the Hand routine and The Disectolator, I'll be presenting both (maybe) in Leesburg VA on Saturday Oct18th at the Temple Hall Farm Regional Park at 1pm. I say 'maybe' because if it's raining or if I can't set up my backdrop, I'll probably have to eliminate the Disectolator.